Artichoke, or globe artichoke, is a perennial thistle, Cynara cardunculus (or C. scolymus) of the Asteraceae family, characterized by pinnately, deeply lobed leaves, and flowers that develop in a large head from an edible bud. The term artichoke also refers to the edible, immature flower head of this plant, including the base, which is known as the heart. The globe artichoke originated in southern Europe around the Mediterranean. There are two other plants for which the term artichoke is applied. These are the Jerusalem artichoke (Helianthus tuberosus), a species of sunflower, and the Chinese artichoke (Stachys affinis) is a species of woundwort. In these two species, the edible part of the plant is the tuberous root, whereas in the globe artichoke the above ground part is the eat, rather than the root. When unqualified, the term "artichoke" nearly always refers to the globe artichoke, which will be the focus of this article. The globe artichoke has been prized as a vegetable since the time of the ancient Greeks and Romans, offering a unique flavor. Numerous cultivars have been developed for flavor and hardiness, including varieties able to survive in cooler Northern climates than the traditional warmer climates required. The globe artichoke belongs to the family Asteraceae or Compositae, a family of dicotyledonous flowering plants, including the daisy, lettuce, chicory, chrysanthemum, safflower, dandelion, ragwort, and sunflower. The name "Asteraceae," derived from the type genus Aster, refers to the star-shaped flower head of its members, epitomized well by the daisy. "Compositae," an older but still valid name (McNeill et al. 2006), means "composite" and refers to the unique inflorescence. The most common characteristic of all these plants is an inflorescence or flower head (formerly composite flower): A densely packed cluster of numerous, small, individual flowers, usually called florets (meaning "small flowers"). Within the Asteraceae, globe artichokes are considered to be "thistles." Thistle is the common name of a group of flowering plants characterized by leaves with sharp prickles on the margins. Prickles often occur all over the plant—on surfaces such as those of the stem and flat parts of leaves. These are an adaptation to protect the plant against herbivorous animals, discouraging them from feeding on the plant. Typically, an involucre with a clasping shape of a cup or urn subtends each of a thistle's flowerheads. The term thistle is sometimes taken to mean exactly those plants in the tribe Cynareae (synonym: Cardueae), a group to which the globe artichoke belongs. The globe artichoke belongs to the Cynara genus, a group of about 10 species of thistle-like perennial plants, originally from the Mediterranean region, northwestern Africa, and the Canary Islands. The globe artichoke, C. cardunculus, grows to 1.5 to 2 meters tall, with arching, deeply lobed, silvery glaucous-green leaves 50 to 80 centimeters long. The flowers develop in a large head from an edible bud about 8 to 15 centimeters diameter with numerous triangular scales; the individual florets are purple. The edible portion of the buds consists primarily of the fleshy lower portions of the involucral bracts and the base, or center, known as the "heart;" the mass of immature florets in the center of the bud is called the "choke." These are inedible in older larger flowers. The origin of artichokes is unknown, though they are said to have come from the Maghreb (North Africa), where it is still found in the wild state. In the Arab world, they are known as Ardi-Shoki (ارضي شوكي) which means "ground thorny." The cardoon, a naturally occurring variant of the same species, is native to the Mediterranean, even though it has not been mentioned in Classic literature. Artichokes were cultivated in Sicily in the Greek period, the Greeks called them kaktos. In this period, the cultivated leaves and flowerheads, which cultivation had already improved from the wild form, were eaten. The Romans, who called the vegetable carduus received the plant from the Greeks. Further improvement in the cultivated form appear to have taken place in the Muslim period in the Maghreb, although the evidence is inferential only (Watson 1983). Globe artichokes are known to have been cultivated at Naples around the middle of the ninth century, and are said to have been introduced to France by Catherine de' Medici. Pierre de L'Estoile recorded in his journal on June 19, 1576, the fact that at the wedding of two courtiers, Queen Catherine de Medici "ate so much that she thought she would die, and was very ill with diarrhoea. They said it was from eating too many arthchoke bottoms." The Dutch introduced artichokes to England, where they were growing in Henry VIII's garden at Newhall in 1530. They were introduced to the United States in the nineteenth century, to Louisiana by French immigrants and to California by Spanish immigrants. The name has originated from the Arabic al-kharshof, through a Northern Italian dialect word, articiocco (Harper 2001). Today, globe artichoke cultivation is concentrated in the countries bordering the Mediterranean basin. The main producers are Italy, Spain, and France. In the United States, California provides nearly 100 percent of the U.S. crop, and approximately 80 percent of that is grown in Monterey County. The cultivar "Green Globe" is virtually the only kind grown commercially in the United States. Artichokes can be produced from seeds or from vegetative means such as division, root cuttings, or micropropagation. Though technically perennials, which normally produce the edible flower only during the second and subsequent years, certain varieties from seed can be grown as annuals, producing a limited harvest at the end of the first growing season, even in regions where the plants are not normally winter hardy. This means that home gardeners in northern regions can attempt to produce a crop without the need to overwinter plants with special treatment or protection. The recently introduced seed cultivar "Imperial Star" has been bred to produce in the first year without such measures. An even newer cultivar, "Northern Star," is said to be able to overwinter in more northerly climates, and readily survive sub-zero temperatures (PSR 2008). Commercial culture is limited to warm areas in USDA hardiness zone 7 and above. It requires good soil, regular watering, and feeding plus frost protection in winter. Rooted suckers can be planted each year so that mature specimens can be disposed of after a few years, as each individual plant only lives a few years. The peak season for artichoke harvesting is the spring, but they continue to be harvested throughout the summer, with another peak period in mid autumn. When harvesting, they are cut from the plant so as to leave an inch or two of stem. Artichokes possess good keeping qualities, frequently remaining quite fresh for two weeks or longer under average retail conditions. 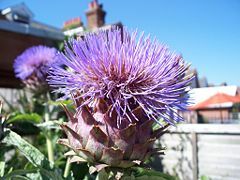 Apart from food use, the Globe Artichoke is also an attractive plant for its bright floral display, sometimes grown in herbaceous borders for its bold foliage and large purple flowerheads. Green color, big size: Camus de Bretagne, Castel (France), Green globe (U.S.). Green color, medium size: Blanca de Tudela (Spain), Argentina, Española (Chile), Blanc d'Oran (Algeria), Sakiz, Bayramapsha (Turkey). Purple color, big size: Romanesco, C3 (Italy). Purple color, medium size: Violet de Provence (France), Brindisino, Catanese (Italy), Violet d'Algerie (Algeria), Baladi (Egypt). Spined: Spinoso sardo (Italy), Criolla (Peru). Artichokes are a popular food, raniging from jumbo size to baby artichokes from the very small buds lower down on the stalks (Herbst 2001). In the United States, whole globe artichokes are most frequently prepared for cooking by removing all but 5 to 10 millimeters or so of the stem, and (optionally) cutting away about a quarter of each scale with scissors. This removes the thorns that can interfere with handling the leaves when eating. Then, the artichoke is boiled or steamed until tender. If boiling, salt can be added to the water, if desired. 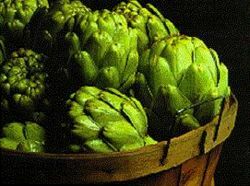 It may be preferable not to cover the pot while the artichokes are boiled, so that the acids will boil out into the air. Covered artichokes can turn brown due to the acids and chlorophyll oxidation. Leaves are often removed and eaten one at a time, sometimes dipped in vinegar, butter, mayonnaise, aioli, or other sauces. In France. artichokes are very popular deep fried. In Italy, artichoke hearts in oil are the usual vegetable for spring in the "Four Seasons" pizza (with olives for summer, mushrooms for autumn, and prosciutto for winter). In Spain, the more tender younger and smaller artichokes are used. They can be sprinkled with olive oil and left in hot ashes in a barbecue, sauteed in olive oil with garlic, or sauteed and combined with eggs in a tortilla (frittata). More often cited are the Greek artichokes (a la polita), of which probably the finest examples are to be found on the island of Tinos. The heart of the artichoke is also eaten. The term hearts and bottoms are sometimes used interchangeably, but in reality the heart is the portion of the fleshy artichoke base including the attached pale tender leaves and the bottom is the entire base without the leaves (Herbst 2001). Artichokes can also be made into an herbal tea; artichoke tea is produced as a commercial product in the Dalat region of Vietnam. Artichoke is the primary flavor of the Italian liquor Cynar. Artichokes also have medicinal use. Dried or fresh leaves and/or stems of Cynara are used to increase bile production. Cynarin, an active constituent in Cynara, causes an increase in bile flow (Matuschowski et al. 2005). Harper, D. 2001. Artichoke. Online Etymology Dictionary. Retrieved October 14, 2008. Mabberley, D.J. 1987. The Plant Book. A Portable Dictionary of the Higher Plants. Cambridge: Cambridge University Press. ISBN 0521340608. Matuschowski, P., A. Nahrstedt, and H. Winterhoff. 2005. Pharmacological investigations on the effect of fresh juice from Cyanara scolymus on choleretic effects. Zeitschrift für Phytotherapie 26(1): 14-19. McNeill, J., F. R. barrie, H. M. Burdet, et al. 2006. International Code of Botanical Nomenclature. International Association of Plant Taxonomy (IAPT). Retrieved October 14, 2008. Peters Seed and Research. 2008. 'Northern Star' globe artichoke seed. Peters Seed and Research. Retrieved October 14, 2008. Robbins, W. W., M. K. Bellue, and W. S. Ball. 1970. Cynara Linnaeus. Flora of North America 19, 20, and 21. Retrieved October 14, 2008. Watson, A. M. 1983. Agricultural Innovation in the Early Islamic World: The Diffusion of crops and Farming Techniques, 700-1100. Cambridge: Cambridge University Press. ISBN 052124711X. This page was last modified on 16 October 2008, at 20:45.